Various factors can result in the prices of shares rising or falling. These range from changes in how investors feel regarding the share market to news about the company’s revenue. The compilation of factors such as the media, natural disasters, opinions from investment consultants, political unrest, supply and demand as well as risk and lack of suitable alternatives contribute to the prices of shares. Company factors that may affect share prices include news releases regarding profits, earnings and estimated earnings in the future. Dividend announcements, new contracts, new products or product recalls, employee layoffs, management changes, mergers, takeovers and accounting errors are among the aspects of company performance and news that influence the stock price. The share price of companies within similar industries usually corresponds with each other. Market conditions affect companies in similar industries in similar ways. However, there are times when the share price of a particular company benefits from negative news about competitors when companies compete for one market. Investor confidence can lead to the market going up or down and this can cause the rise or fall of stock prices. The stock market’s general direction can influence stock value. The bull market is characterized by a strong market that consists of rising stock prices and corresponding investor confidence. This is often linked to economic prosperity or recovery and investor optimism. 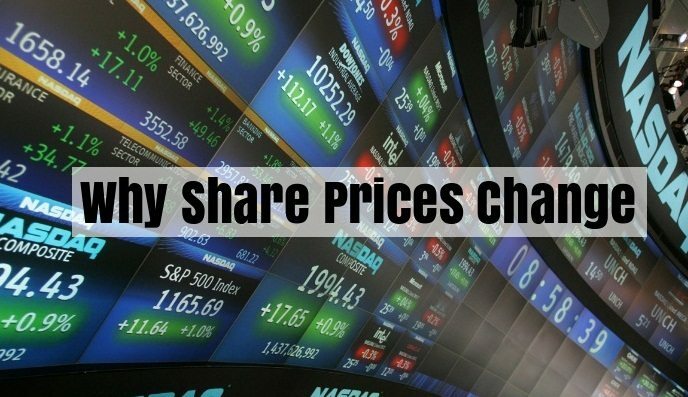 If the economy appears to be expanding, there may be a rise in share prices. Investors are likely to buy more shares when they think that there will be future profits and stock prices will be higher. An uncertain economic outlook may cause investors to reduce buying or begin selling. Inflation refers to an increase in consumer prices. This usually slows down sales and lowers profits. Higher prices often cause the interest rates to rise and such changes can reduce stock prices. When prices fall, companies experience lower profits and economic activity decreases. If stock prices go down, investors may begin selling shares ad moving to other investments. Lower interest rates lead to people borrowing more with the objective of increasing spending and stimulating economic activity. Changes that take place in the world can have an impact on the economy and share prices. Higher energy costs can result in lower sales, profits and share prices. Terrorism can cause the economy to slow down and reduce stock prices. New governments may create new policies. These changes may be aimed at having a positive effect on business but sometimes they do not. Changes in interest rates and inflation can affect share prices. Companies sell their products to other countries and if the dollar rises, customers will be compelled to spend more for the goods. This may lower sales and subsequently lead to a fall in stock prices. If the value of the dollar falls, this makes it more affordable for others to purchase products and can increase the share prices.